As a Mother, naturally you put your children first. So dressing yourself for you son or daughter's wedding can prove to be difficult. We know how busy you are! You are devoting your time to plan the perfect wedding. You are making sure that your child looks incredible and all the details are perfect, not to mention you have your own life to live! We are here to remind you to take a day to think about yourself because your children want you to look beautiful at their wedding. These photographs will last a lifetime! You don't want to wait until the last minute and end up with something you don't feel good in just because you didn't think you should put yourself first for a moment. Here are some tips to help get you on track! Note to the Bride: After you find your dress and bridesmaid dresses, help your Mother! She needs you, she wants to shop with you and she wants you to be happy with how she looks. Give her encouragement and make this a fun and easy experience for her. Picking out her dress is the most difficult job she has in helping you plan you wedding. Why? Because she is not 20 or 30 something anymore. Her body has changed and it may not be as easy to fit as it was years before. Restricting her to a style or color that isn't right for her makes things difficult too. Give her a range of colors to choose from that looks nice with the wedding party. Having an idea about how you want her to look is great, but being extremely specific will make it very difficult for her. Most of all, enjoy this experience and time together and have some fun! Shop early! We can never say this enough. The sooner the better. Forget the 5 lbs you want to loose, and any other hang ups you have about yourself. Alterations can always help you with the fit closer to the wedding date. So if you lose it, alter it! Shopping early also helps with your level of stress. If you find the perfect dress and need a different size or color, you will have plenty of time to order it and get alterations. How early should you start looking you ask? It is never too early! Special orders can take up to 15 weeks so keep this in mind when you are planning. Be open to different styles. We always say, you never know until you try! Sometimes you will be surprised about what looks good on you. It never hurts to try something on, especially if you aren't much of a shopper. Also, let your sales consultant help you. They know their dresses better than anyone and after seeing you in some styles, and speaking with you about what you want, they can pull for you. Nine times out of ten, the sales consultant is the person that picks THE dress for you. Let them do what they do best! How formal is too formal? This is a question with many different answers. The first question is what time is the wedding? If it is before 5 o'clock then you may not want a lot of beading or sequins, etc... You could also wear short or long. If it is after 5 o'clock then you can go as formal as you feel comfortable. Typically, long is the way to go, but t-length may also be acceptable. Also consider the location of the wedding, climate, and if it is indoors or outdoors. And, what the bride is wearing? How formal is her gown? Tell your consultant as many details as you can so they can help guide you! Enjoy the experience! This is a happy time, there is going to be a wedding! Don't get hung up on things that are just a small part of the big picture. Everyone involved is important and of course you want everything to be perfect! It will be, if you plan accordingly and don't get discouraged because some styles didn't look good on you. 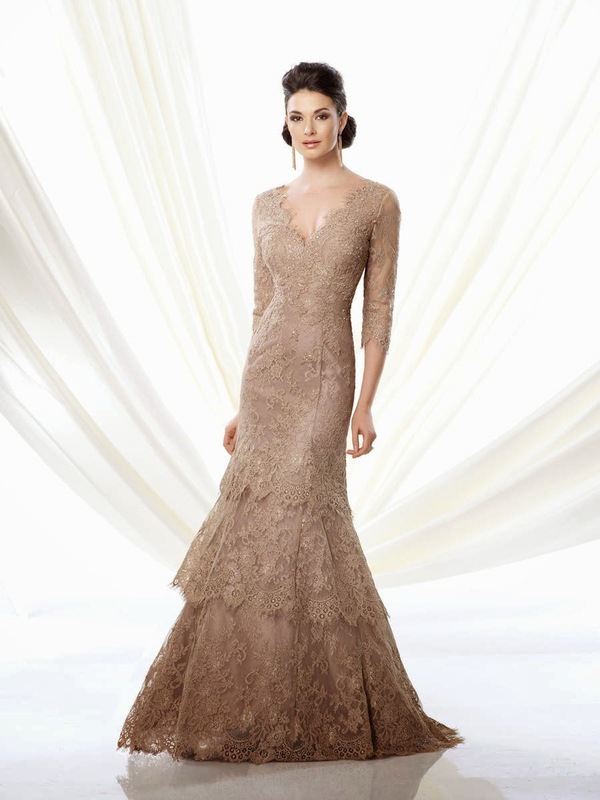 You will find the perfect dress that was made for you and the wedding will be spectacular! Happy Shopping!